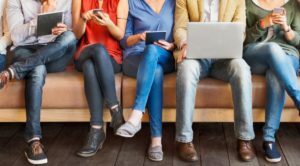 Overall consumption of media plateaued in the UK, according to eMarketer‘s latest forecast. 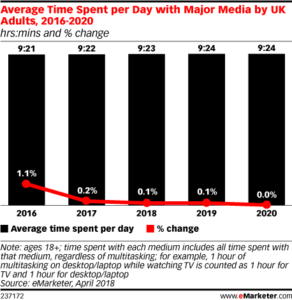 eMarketer expects UK adults to spend an average of 9 hours, 23 minutes each day watching, streaming, reading and listening to media this year. The most notable aspect of this figure is that it represents the first year of flat growth since eMarketer started tracking time spent with media in the UK. Since that time, adults have been adding incrementally to their media time. This latest forecast indicates that media consumption has reached a saturation point. • Adults in the UK will spend half of their media time with digital. • Mobile will account for more than 32% of media time in the UK—overtaking TV for the first time.